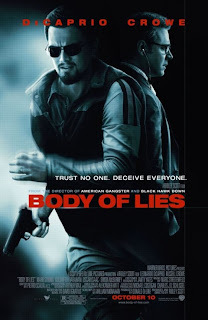 Contemporary and pacy from the first to the last frame, Body of Lies is a speedy entertainer. We are drawn in to the games of deceit, lies, power, terrorists and the CIA (Central Investigative Agency) (In short, America saving the world). DiCaprio plays a CIA agent riding danger in the streets of Iraq and Jordan, while Crowe plays his senior, adroitly controlling operations through his cell phone in America. As with his previous film American Gangster, Scott manages to hold our attention with his apt treatment and by extracting great performances from Dicaprio and Crowe - now a Scott regular. Its not a classic, but certainly not boring. Why did Amitabh Bachchan reject such a meaty role of Honey? Insecurity?